The region of the face is one of the most visible regions in aesthetic surgery. Major surgical procedures without scars play an integral role in overall facial beauty. 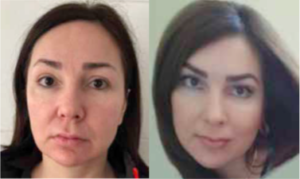 Many techniques can be used to correct face shape and position, including nonsurgical and surgical approaches. Mostly we prefer to combine different techniques with an emphasis on minimal invasive procedures. Some of our combination therapies, we show in this article. The face region is one of the most visible parts in aesthetic surgery. Face appearance and its counters play an important role in forming facial expressions and aesthetic perception, therefore, major surgical procedures without scars play an integral role in overall facial beauty. All parts of the face are responsible for revealing emotions by creating facial expressions through the change of their shape and position. Disproportional anatomical parts of the face in terms of shape, and proportion may alter the overall appearance and characters of the face cosmetically, making the face look less attractive. Functional or age-related alteration of the face is usually caused by prolonged hyperactivity, hormonal changes of the facial musculature. With such aesthetic importance, correction of a face alteration, such as asymmetry, deformity, disproportion is a common procedure in aesthetic practice and remains an important procedure for body rejuvenation. Fig. 1 a+b: Treatment of moonface contour with threads and BTX. Fig. 2 a+b: Treatment more declined facial structures with facelift short scar technique plus laser, fillers, BTX. Fig. 3 a+b: Treatment of more declined facial structures with endosco- pic facelift technique plus laser, fillers. Numerous techniques can be used to correct face shape and position, including nonsurgical and surgical approaches. Each of the methods has to be considered and tailored individually to patient conditions, goals, and needs by addressing the symmetry, elevation, contour, and wrinkle reduction of the face perimeter in order to achieve satisfactory results. There are two key components in achieving satisfactory face correction and reconstruction. The first component is the recognition of any alteration using a comprehensive facial evaluation, resulting in the ideal measurement and the position. The second component is the selection of the appropriate procedure that will give an optimal result for the patient individually. Mostly we prefer to combine different techniques with an emphasis on minimal invasive procedures. 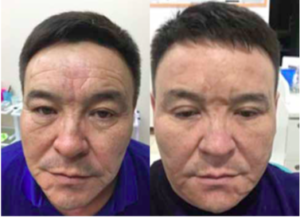 Non-surgical rejuvenation by volumetric increase with several types of interventions, including injections with a variety of gels or fat, added the “third dimension” to facial rejuvenation. Ablative or non-ablative resurfacing techniques allow the improvement of the skin surface, but do not adequately lift the underlying ptotic tissues, an important step in achieving a younger appearance. 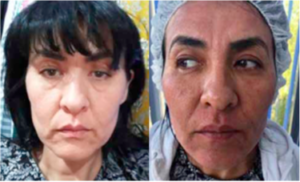 The use of threads for facelift procedures is not a new idea. This procedure involves the passage of sutures under the skin of the face and neck to compensate for sagging and flaccid tissues, avoiding large incisions and greatly reducing recovery time. A big dilemma is to perform which combinations in which sequence – following or parallel – should be chosen to arrive at the horizon of a better efficacy? 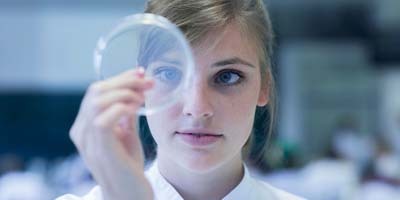 There are surely more combinations which raise the efficacy scale like HiFu ultrasound and Fillers, radiofrequency and mesotherapy, lypolisis injection (cryolypolisis mashine) and fillers but a lot of work still has to be done to find optimal combinations which have a high potential for synergies and therefore create results better than the addition of the single therapies. The conclusion of our experience with combinations is simply that this will be the next bigger step to optimize treatment results, more than any new single therapy will bring us. No conflict of interest or financial interests.